One of Stuart and Sandra’s first dates involved rowing a dingy out into Port Phillip from the Mornington Harbour. The sun was shining and the seas were calm. Flathead were the main species on the bite. 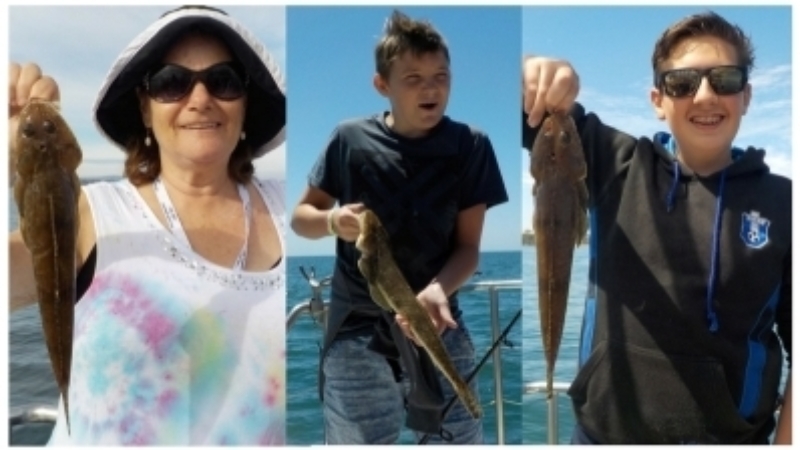 Fishing was a mutual passion so the day was heaps of fun for them both. There were plenty of fish caught, from tiddlers (which were returned) to some decent sized keepers that were taken home for dinner. A fabulous way to share some time with someone in the budding stages of a relationship. Flathead are often referred to as the ‘channel rats’ of the sea. Fishermen often refer to the Flathead as Fatties, Frogs or Lizards. 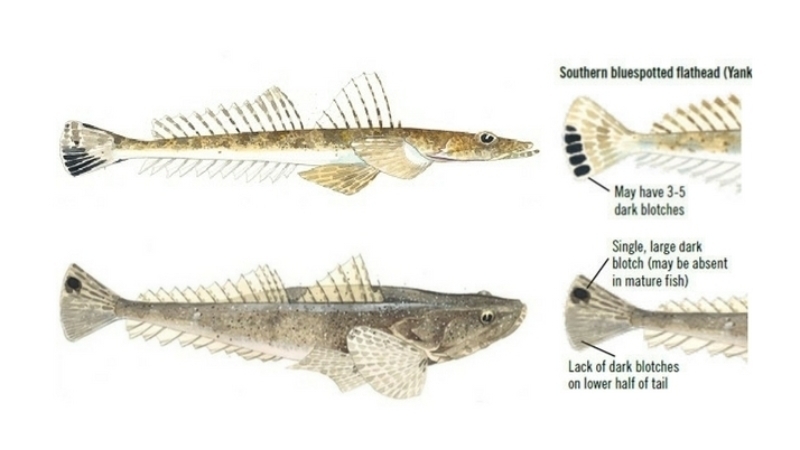 Port Phillip Bay is home to a small sample of the Flathead family, the most common species being the Southern Bluespotted Flathead (aka the Yanky). Its scientific name is Platycephalus caeruleopunctatus. Yanky Flathead are sandy in colour with scattered blue spots. There is a series of elongated splotches on the tail. This species can grow up to 70 cm in length. The biggest caught on board the Plover has been 63 cm. 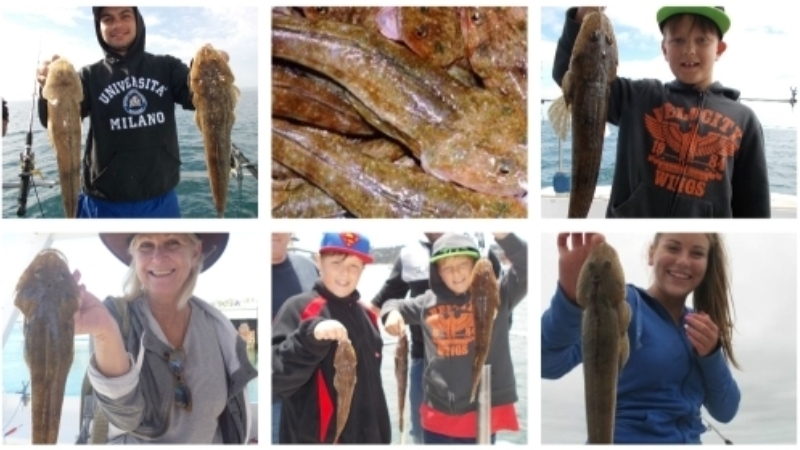 Dusky Flathead are also a possibility in Port Phillip but guests fishing with Bay Fish N Trips are yet to catch one. They are most commonly found in the estuaries from Lake Tyers to Mallacoota Inlet. The crew on board Plover always check the Flatties that come on board as the rules applying to Duskies are different. 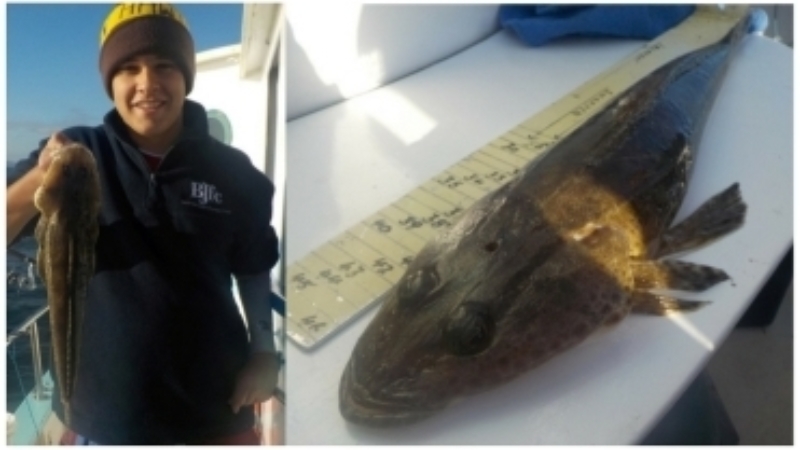 To keep a Dusky Flathead caught in Victorian waters, they must measure between 30 – 55 cm and the bag limit is five. A Dusky can reach up to 1.2 metres in length and up to 15 kg in weight. These Flathead have a very distinguishable single spot on the tail. Flathead can be found in the Indo-Pacific region with up to 40 different species located in Australia. They are a salt water fish that inhabit estuaries, bays and open ocean water but Duskies being caught in fresh water rivers is not unheard of. 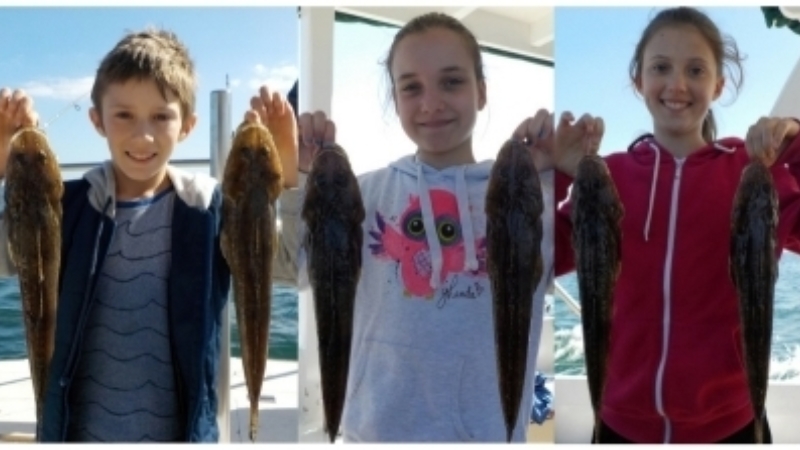 Other species to be found in Victorian waters include: Tiger Flathead, Rock Flathead and Southern Sand Flathead. Flathead are very common and very distinguishable from other fish species. In general, the Flathead received its name because of their notably flat heads. Their elongated bodies are also flattened but wide and very low in height. Eyes are located on the top of the head which enable the fish to have excellent vision of prey swimming above them. Tails are vertical to the rest of the body and the dorsal fins are prominent along the back of the fish with pairs of large pectoral fins (like rounded fans) followed by smaller pairs of pelvic fins, a set on each side. Two other sets of fins stretch from the middle of the fish on the upper and lower sides of the body to the tail. They have two spikes on either side of the head near the gills and a third one just in front of the dorsal fin that are venomous. While not fatal, the spikes can inflict pain. Fishermen recommend to rub a wound on the belly of a Flathead as the slime will ease the pain (surprisingly it works). The First Aider recommends to pour very hot water over the area which can be painful in itself but also effective. Flathead are very skilled at hiding their bodies in sand or mud while waiting to strike at prey. They eat other fish, crustaceans and sand dwelling squid. Cannibalism is common in the larger individuals. Actually, Flathead have veracious appetites and will generally have a go at any bait on a hook. One of the guests a few years back used a piece of snake confectionery with some success. Life cycles vary but females have been known to live up to 20 years with females outliving males. Females reach reproductive maturity around 5-6 years, again depending on species and males around 4 years. Spawning is over an extended period from spring to autumn. Females can produce 1-3 million eggs per spawn depending on species. The flesh is white, firm and sweet to taste. They are delicious cooked whole on the bone or filleted. 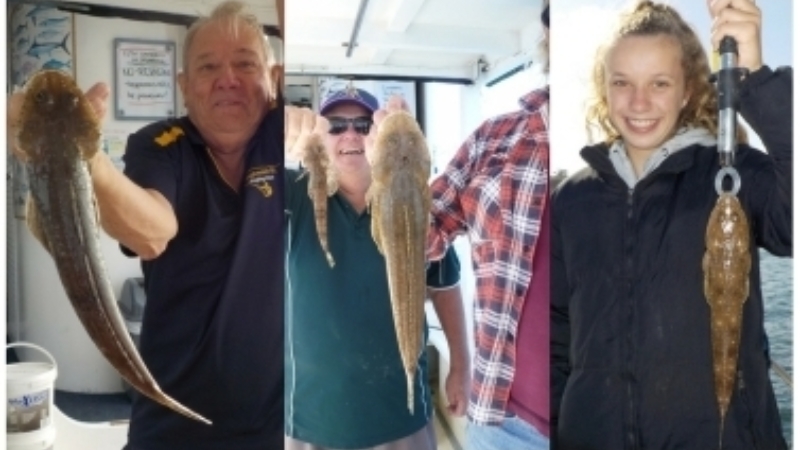 Check out the Flathead recipe on the Bay Fish N Trips website or if you are lucky to catch some on board the Plover we have recipe sheets for you to take home. Restaurants often feature Flathead tails on the menu. TV cooking shows such as Master Chef brought the humble Flathead into the limelight. They used to be cheap, but with the onset of the cooking shows they are now highly sought after and have become a pricey commodity at the fish markets. 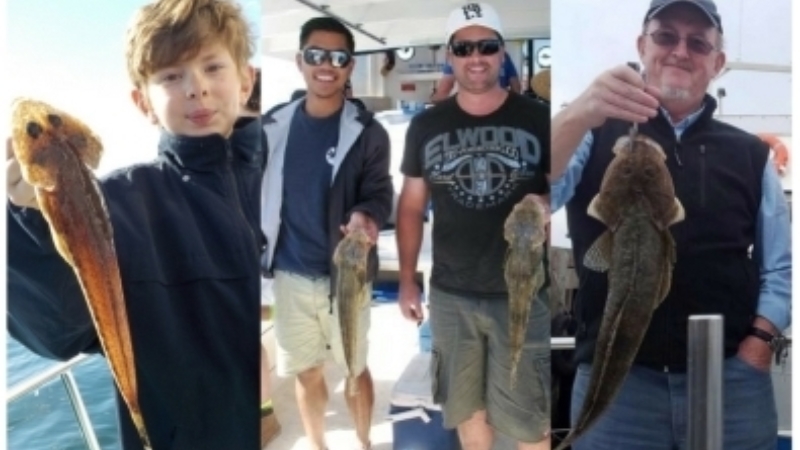 Flathead catches happen all year round but are best during the warmer months. The fish stocks are at sustainable levels and will remain so if fishermen follow the guidelines put out by the Fisheries department in each state.